Today's special guest star, Rubeena Ianigro, is no stranger to Winnie & Walter as she was our April 2016 Leading Lady and her work is always a treat! Rubeena is also an incredibly generous, welcoming and giving person with a huge amount of talent and skill. Please give her a warm w&w welcome! Hello, friends! I am happy to be joining the winnie & walter 4th Birthday Bash this month as a Special Guest Star. Shay is one of the sweetest, most generous people in the craft industry and I had the honor of meeting her at Creativation last month! I have two projects to share with you today that represent my style the best. Loose watercoloring is very relaxing. 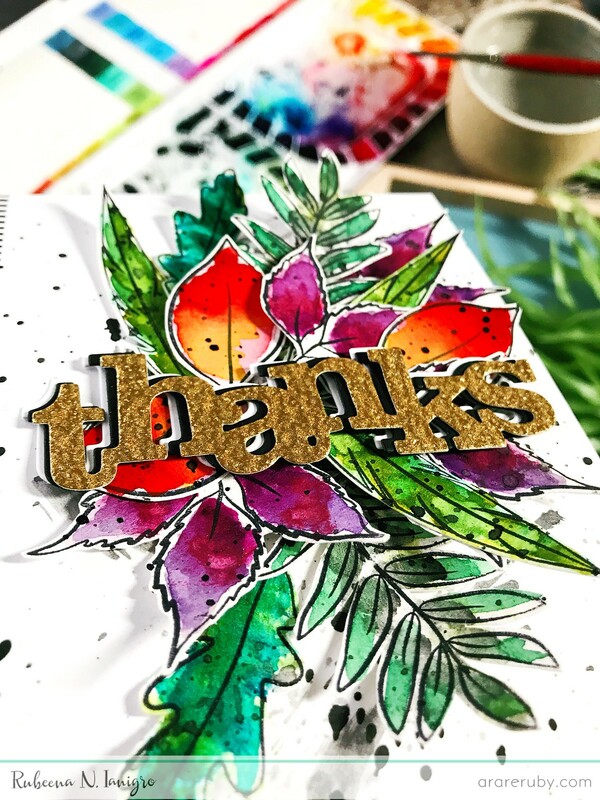 I have so much fun working with greenery so I decided to play with In Bloom: Renee's Leaves for my first card. I stamped an assortment of the stamps on watercolor paper using a waterproof black ink pad. Then, I used my Mijello Mission Gold watercolors to color. I added black splatters and fussy cut the images. For the card base, I stamped one of the line borders from Scenery: Stripes 2 on the far left edge and then added black splatters to the base. I arranged all the leaves first using glue dots. 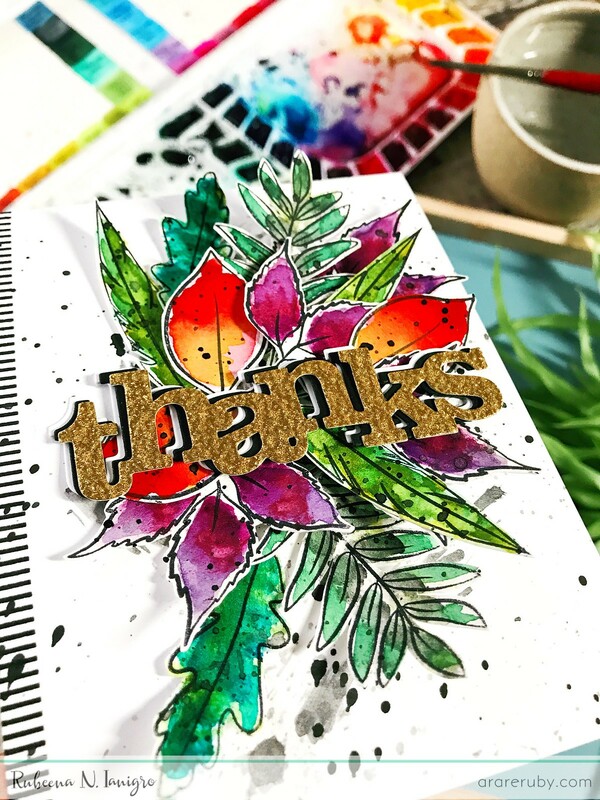 I finished the card off by adding the die-cut sentiment (which was cut in gold glitter, black, and white cardstock layers) from In a Word: Thanks Cutaway. 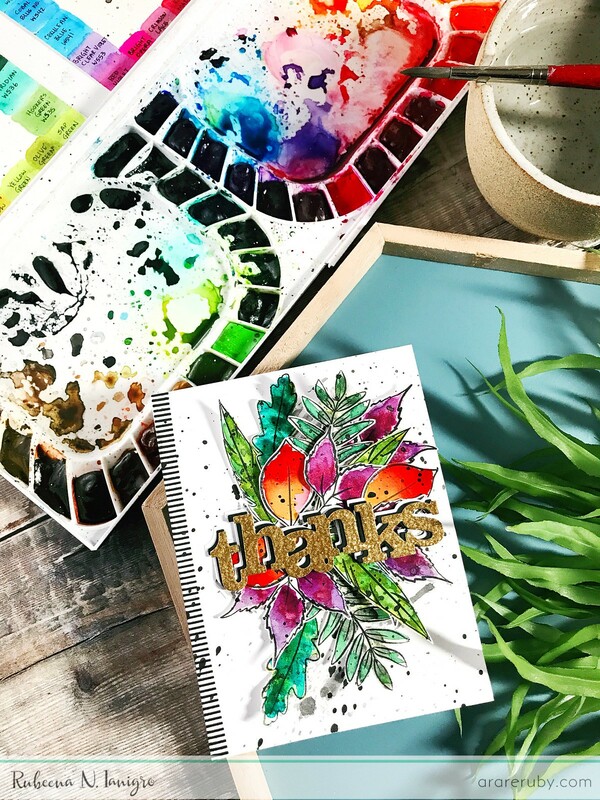 This card shows all the things I love when it comes to creating: layers, black and white stripes, splatters, bold colors, die-cut words, and gold glitter! For this card, I incorporated the Die Challenge with Lydia. For my next card, I continued watercoloring but focused on using Party On with Evelin T Designs. I also enjoy one-layer cards. I stamped the four critters on watercolor paper using the same waterproof black ink pad and masked off each one before stamping the next. Then I colored loosely with my watercolor palette. Once everything dried, I stamped the beautiful sentiment from the same set and then taped the finished piece to my white cardbase. So fun and simple! For this card, I incorporated the Four Challenge with Shay since I used all four critters. 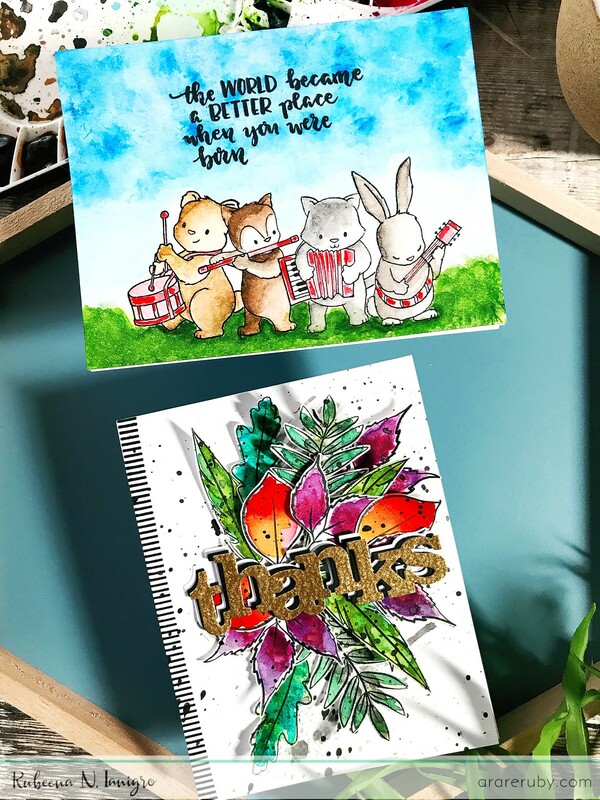 You still have time to enter any of the challenges list on the winnie & walter Blog for the 4th Birthday Bash - Shay is offering some AMAZING prizes! Thank you so much for having me here and for everyone who stops by and leaves us love. We really appreciate the support. I hope you were inspired by my work, and I can't wait to see what everyone does with winnie & walter's products. Have a great week! These cards are gorgeous, Ruby! I especially love those bright florals!!! Thanks so much for stopping by, Jessica!! I appreciate it! So super cuuuuuuuute! 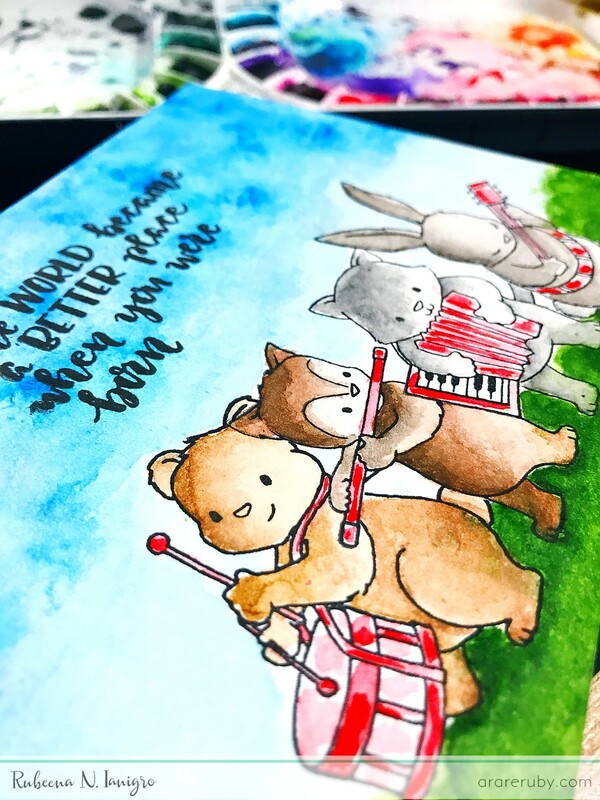 I love those adorable musical critters! The vibrant florals are beautiful! Super duper cute! Love the bright and so colorful floral creation so much! Wow ..loved the loose wayercolouring gives an artsy look ! Both the cards are wonderful! Two lovely designs. I'm especially captivated by your floral card...oh, to water-colour as you do! Gorgeous! aww thanks so much, Kathy!! 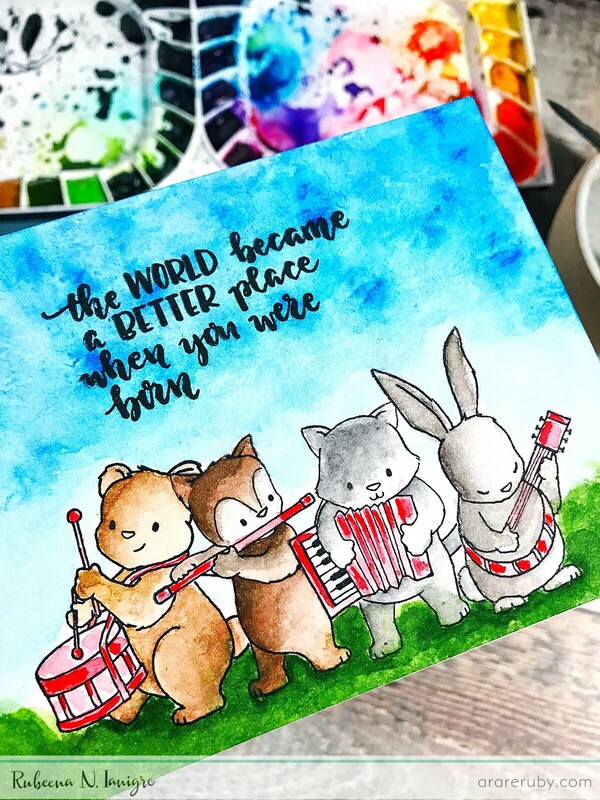 WOW.. Gorgeous card Rubeena..love the bright colours..
Love the vivid colors and the very cute critters creating music. Love you for having me, Shay!!! THANK YOU!! 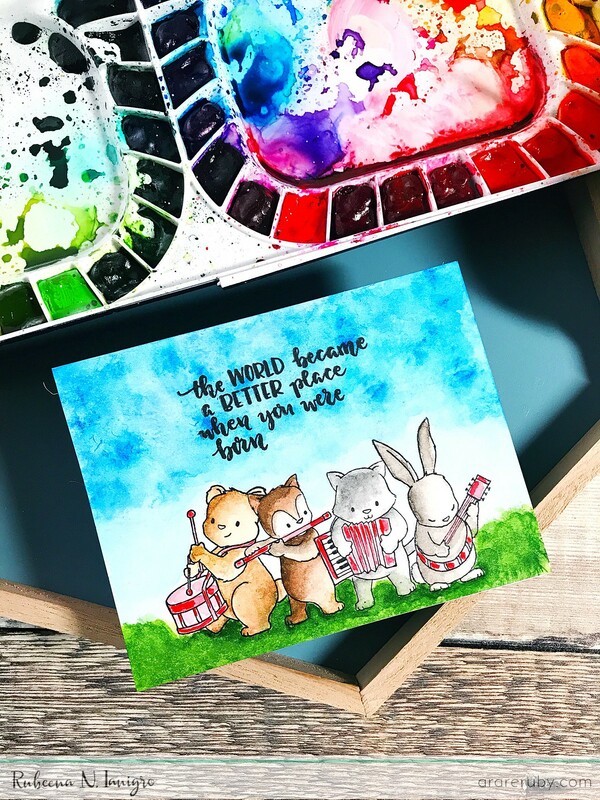 Your watercolor cards are an inspiration to me. Thanks for sharing your creativity. Well done show casing the stamps!! oh thank you so much! I truly appreciate that! !